A recent article in The New Yorker, "The Death of Kings" by Nick Paumgarten, May 18, 2009, provides an tour through the stations of the current financial hell, from the earliest signs (between four and one hundred and two years, depending) to full-blown imminent-disaster predictions. Even though you may have read extensively on the topic, this story is exceptional, a gripping overview of the mess illuminated with anecdotes. A private-equity executive Paumgarten interviewed said that he sensed the jig was up when his cleaning woman in NYC took out a subprime loan to buy a house in Virginia. And you get a peek how people used to life in the tippy top income bracket are coping. A Wall Streeter advises his buddies who have lost at least half their net worth to have what he terms "The Conversation" with their partners, an event that he warns may result in termination of the relationship. 1. Essential: Your mortgage or rent, food, gas and other requisites. Pay your expenses, maintain your credit rating. 2. Discretionary: Private school tuition, clothing, entertainment, massages and personal trainers, etc. I liked this short, sharp three-bin plan. Some people will say, "Ha! I never had money for category #3, or even much of #2", but remember, these high-flyers did. As someone observed in the article, dropping from 15 to 1.5 million in assets is a terrifying plunge, if that's what you were used to. 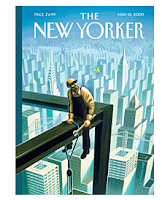 You can read an abstract at The New Yorker site; the compete article is available only to magazine subscribers. Or read it for free at the library. During the same week, Le Duc and I went to see Ricky Jay perform his new show, "A Rogue's Gallery" and guess who was up on stage with Ricky? You should have seen Le Duc shuffling! Ricky dealt into his hand, and Le Duc confidently counted the cards he held: six. Then, after a few quick words, how many cards now? "Seven", said a dazzled Duc. One card of six held by an equally baffled woman, standing at the other side of Jay, had somehow left her hands and appeared in Le Duc's. Isn't that's what the whole easy credit scam did? People thought they held an extra card for no effort. But it's a mug's game: in the end, all the cards are the lender's, and many borrowers have nothing left, not even the homes they mortgaged. Jay, in a CBC radio interview with Jian Ghiomeshi the day before his Toronto opening, said that greed was the quality necessary to pull off a con, and that many people had succumbed to this vice in recent times. "It starts small", he said, "with something like downloading music you don't pay for. It's easy to fish them in from there." Asked if he ever used his powers to fleece someone, Jay cited his grandfather, a magician and beloved mentor. " 'Don't ever play cards'", Jay said he told him. " 'If you win, they'll think you're cheating, and if you lose, they'll think you're a lousy magician.' 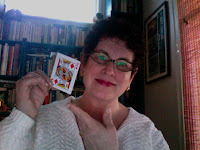 "
My souvenir of "Rogue's Gallery" was one of Jay's cards, appropriately, the King of Diamonds. Total Bliss! My ecstasy is no doubt due in part to the fact that I just turned in 120 grades. But it is also because one of my favorite bloggers wrote about two subjects dear to me: finance, which is sort of like frugality. Haven't yet had time to read any New Yorkers lately, but can do so now. And Ricky Jay. Forgive me for a little bit (OK. a lot) of jealousy! I think there was a long New Yorker profile of him many years ago. Also, have you seen some of the films he's been in (like Spanish Prisoner). And the picture of you--magnificent! Are those your books in the background? movies, books; have seen him on Broadway. The only negative about show was Jay resorting to video clips to show some card handling; he performed maybe five effects, and told many stories. Congratulations on your grading feat, whew! I worked in SF from 1999-2008. The height of dot com boom and the real estate boom in SF. It was always a lunchtime conversation between by Admin Asst and I when one of our hourly employees bought a house - we were not buying houses. Something was certainly amiss and upside down over the last 10 years or so! Love the blog today. The only thing that pained me about his budget triage was the deep cut to spending on the arts, which will hurt a lot of artists. I find a lot of people who can afford to buy a lot of electronics and other junk and invest very little in the arts. The subprime mortgage granted his cleaning lady is a reminder of how little housing there is for the many hard-working people such as cleaning staff, workers in the service industry and many blue-collar and clerical workers (not all work at unionised car plants or in the civil service) who will never be able to afford a mortgage on a single-family home in an urban area but who do need to be housed if one wants their services and labour. That is a very lovely picture of you, duchesse. lagatta: That is indeed a beautiful place to read! Americans deeply value home ownership (more than some other cultures) and it's this wish that helped amplify the debt and foreclosure mess. I'm more interested in the provision of, and access to affordable housing than in ownership. How much of a gross income should be spent on housing? Some people were paying over two-thirds, too high. Oh how fun it must have been to have seen Ricky Jay live! Great picture, too! Lagatta's point is an interesting one...I've lived in a few places where the rental market was drastically underserved, and yet no one was building any apartments, only more 1/2 acre McMansions. I'm so backed up on my New Yorkers, but have a long weekend in Palm Springs coming up, so hope to get some reading in. Pseu: Loved seeing him but thought the show was very good, but not atour de force like fantastic like "Ricky Jay and His 52 Assistants". He was noticeably short of breath and the magicians sitting next to me thought he was pacing himself, preserving his stamina. He also looked heavier than last time I saw him, which may account for the breathing. Oh joy! Ricky Jay must have been fabulous. I am totally green. The New Yorker article was quite fascinating, and yes, a gripping read. I think this fascination with home ownership is interesting. Even though I own my home and am American, I am not convinced it is a necessity for a happy or fiscally secure life. And I am somewhat cautious about the repeated efforts mentioned by our politicians about efforts to relieve homeowners of the burdens of their loans. I remember a bit of grumbling years ago when the Wall Street Journal ran an article stating that home ownership was not necessarily a good investment and there were many cities in the US where rental made more financial sense than ownership. mardel: There are likely books being written about the broader subject, Home ownership and it's contribution to people's current financial crisis; if you hear of them, pls let me know. 3. Hike interest rates or deploy the balloon rate, so debt is monstrous, then devalue the property. Result: Loan default foreclosure. This is simplistic and of course does not apply to a large population, but as a con, it was a sure thing for the right target.